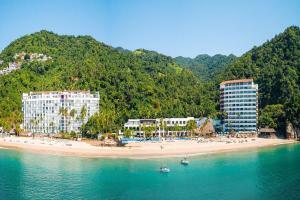 This Ultimate-Luxury® resort is a lush tropical paradise secluded on its own 1,600-foot private beach cove. Out of 337 rooms, 142 have balconies, and most rooms offer a beautiful view of the ocean from the balcony. Delight in two heated pools connected by a splendid waterfall complete with a swim-up bar. Dreams Club Tower: Personalized concierge service and private registration. Ask about complimentary wedding and honeymoon packages. On a private beach, 5 minutes from downtown and 20 minutes from the airport.